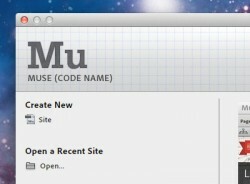 Adobe has debuted their no-code-required website builder code-named Muse. Built off of Adobe AIR, Muse lets the user design websites as they would if they were using the Adobe’s InDesign or Illustrator software. The software is designed to be completely “what you see is what you get” or WYSIWYG, by allowing you to plug-in backgrounds, headers, footers, menus and web widgets. Images for the site, including for a navigation, bar can be worked on in other Adobe software like Photoshop. All of the code for the site works in the background, so designers can “drag and drop” to see how a page will look. Muse is currently only a standalone product. Because of this, it cannot open or edit any projects made with Dreamweaver, Adobe’s other web design software. Another part missing from this beta version are templates. It would be nice if Adobe would add at least five so beginners to the software would be able to get a start on customizing their site. When the user opens the app, you get a familiar Adobe splash screen and welcome window asking you if you want to create a new project or open one. By clicking new project, you get a simplified version of Photoshop’s layout. There is a docking sidebar that moves around the screen that holds text and shape color, transitions for text and a widgets library that has navigation bars, compositions, slideshows and panels. All of which are drag and drop capable. The tools included are a pointer for moving objects, a hand tool for dragging the page, a crop tool, magnifying glass, shape maker, and an add text button. The user has control of how big the page is and what to color the background frame, and pages. To see the website in action, you can export the HTML website to a folder on your computer or on Adobe’s website using an Adobe ID. Adobe Muse is just a code name scheduled to change, but to download the free beta, go to muse.adobe.com.